LILACKING IN SUNSHINE. It's been really cloudy and cold (relatively) in San Diego recently, and today was especially windy. I haven't earnestly begun the daunting task of unpacking yet, so my camera remote was nowhere to be found and my wonderful Dad stepped up to the plate to play photographer. Didn't he do amazing? This unique top is from Chicwish, which I redeemed from Chictopia Rewards. 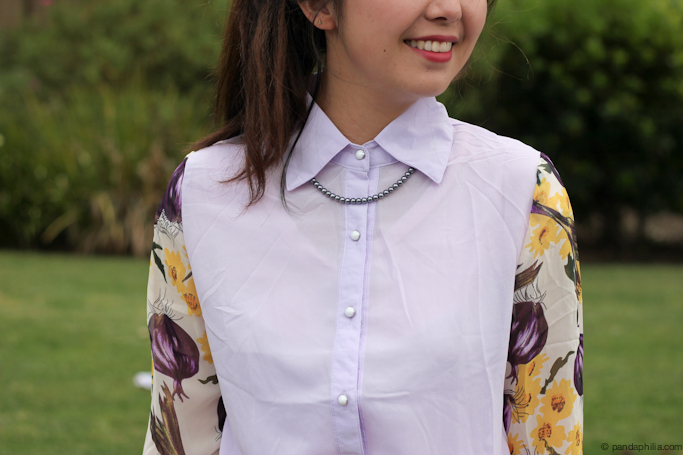 It's a chiffon lilac lightweight material, with long sleeves - perfect for SoCal summers - and features pearl buttons and a fun floral print on the sleeves only. 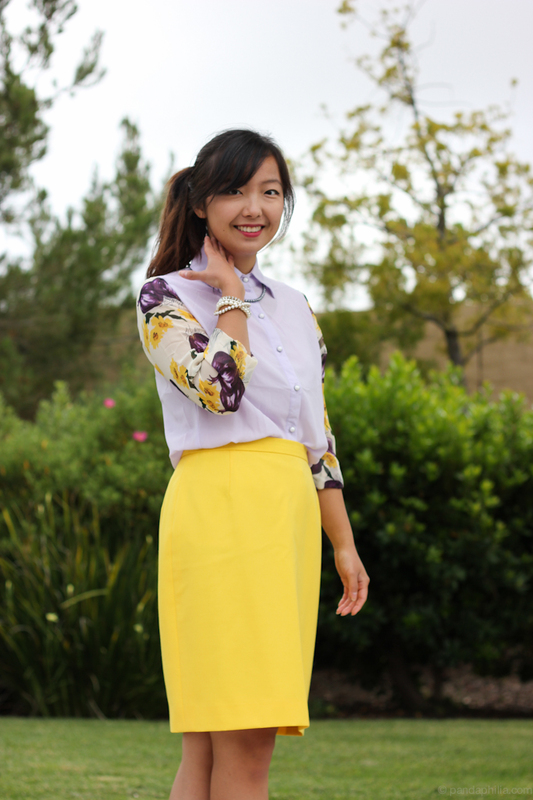 This is a great way to wear the floral trend without being too overwhelming. To contrast the party on bottom, I kept it business on the bottom with a bright yellow pencil skirt I thrifted from Scholarshop for $17, which isn't bad for supposedly designer. It says size 8 but fits like a US 2. This would be a really fun summer work outfit, but this is a case of all-dressed-up-and-nowhere-to-go. I promised myself that I would wear pretty clothes every day for the rest of this summer even if just for sitting around home, no more of my lazy bum sweats that drag down my mood. Recently I have been inspired by Mad Men secretary fashion and threw up my hair into a messy high side ponytail for a modern twist. The winner of the CLAWS Jewelry handmade designer necklace has been announced here! Readers - have you worn an outfit inspired by TV shows or movies? I love how your dad took these photos of you! This is probably my favorite outfit on you, too! How does Chictopia's reward point work? I've been trying to figure out how to redeem my points, but with no avail! Your dad did a really great job with the photos! Your top is very pretty and unique! I also wanted to say thank you for your sweet comment on my blog, you are so sweet and kind! Bright, such a fantastic skirt. It's so eyecatching. Great blog!! Thanks for stopping by!! you look lovely! :) We just found your blog, and our really liking all your posts. Lovely blog you've got! welcome us as your new followers! looking forward to your posts :) Would be glad if you dropped by our blog, and follow if u like what you see? so sweet and ladylike! 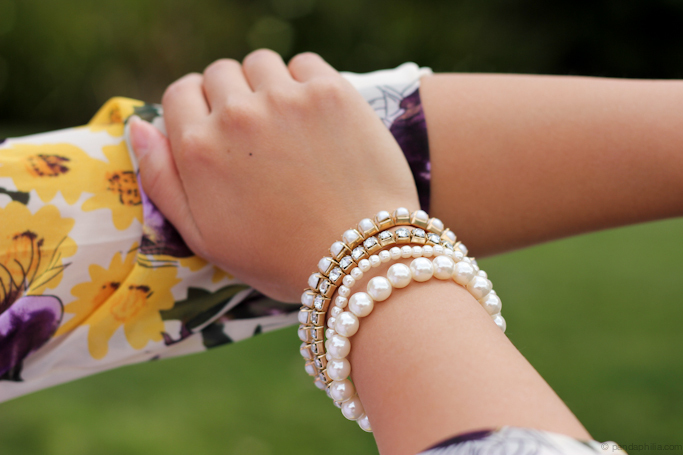 love the striking colors with the classic shoes and pearls. aced it! Looks like your dad has some hidden photography skills Angie! I love how the pictures turned out :D The skirt looks great on you, especially against your tanned legs. 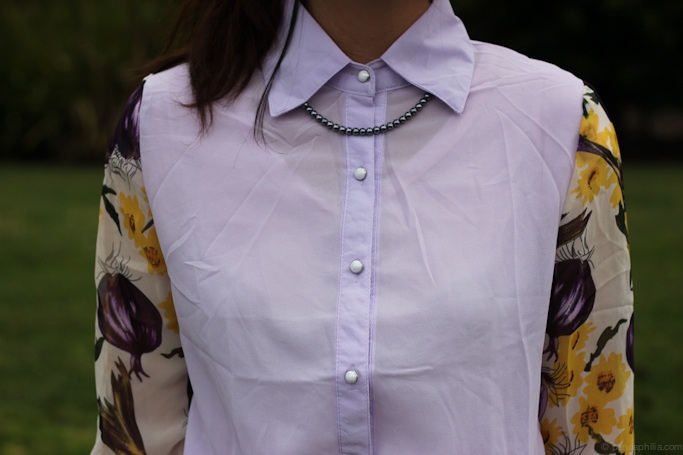 The shirt is really unique too, I love the floral sleeves. Looking great as always! What a unique top! I love that you paired it with yellow skirt, professional yet young and fresh. Would go great with alot of other color skirts too! 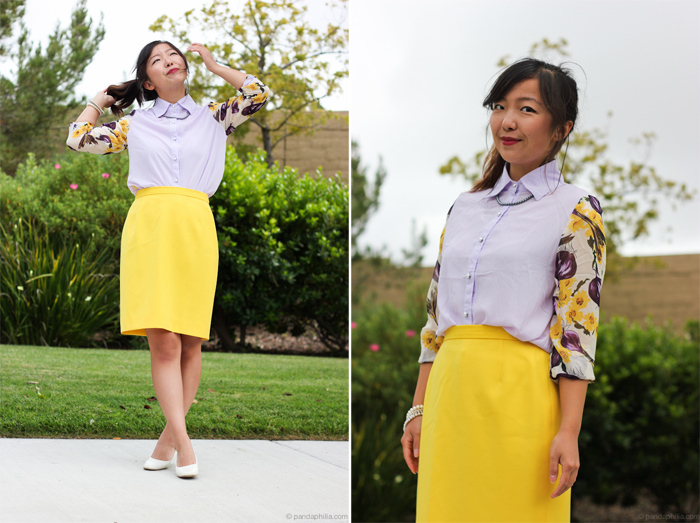 I absolutely love this post and your style and your shirt. Fabulous combo. Ohhhh these are so pretty.